This CD contains sheet music for 236 Ragtime and Music Hall pieces including virtually every well known piano rag of the early 1900's. Here you will find "Maple Leaf Rag", "Nola", "Dill Pickles", "Kitten on the Keys", "12th Street Rag", and lots more you will instantly recognize. There are 46 pieces written by Scott Joplin, 26 by James Scott, 9 by Joseph Lamb, and 6 by Zez Confrey. Since all the copyright dates have been removed, we do strongly suggest you locate a reprint with a copyright date before manufacturing a million music boxes or opening your movie in 687 multiplexes across the US. 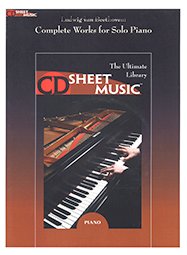 But if you are considering using piano rags for your project, this CD will give you a huge selection to choose from. You just cannot go wrong with all the best known Music Hall works of the US Ragtime era.